metallographic microscope is widely applied for determine, verify and analyze kinds of metallographic and alloy organizing structure, and is widely used in factory or laboratory for casting quality inspection, raw material inspection and processed material metallographic structure study and analysis. 3 10x, 12.5x eyepieces : each 1 e.a. Business Description: Dongguan LmetTest Technology Co.,Ltd Specialized in Environmental & Mechanical Simultation Testing Equipments Manufacturing. As Lab Consultant, my responsibility is help customer select the suitable testing equipments as per their various requirements ,and give suggestions for Lab constructions works. 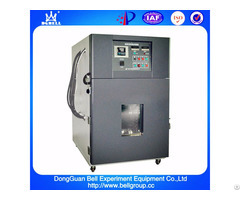 【Salt Spray Test Chamber】ACSS ,NSS,CASS; 110L~2000L.